The origins of kefir are so ancient, no one really knows how it first came to be. One legend has it that kefir was discovered by shepherds high in the Caucasus mountains, who filled leather bags with fresh milk to drink as they followed their flocks. The heat of the mountain sun and the shaking motion as the bag tapped against the sheepherder’s leg caused the milk to ferment, turning it into a naturally carbonated drink that not only quenched their thirst but also kept them healthy. And when they took the “grains” that remained in the bottom of the bag and added them to a fresh bag of milk, that milk was transformed into a fizzy, fermented health drink, too. According to another legend, it was the prophet Mohammed who introduced kefir grains to the region – which is why they are known as “the grains of the prophet”. Some facts are indisputable: for centuries, families that owned kefir grains kept bags of fermenting milk just inside the doors of their homes, where everyone who left or entered could give the bag a shake in passing. They guarded the grains vigilantly, sharing them only with other family members. 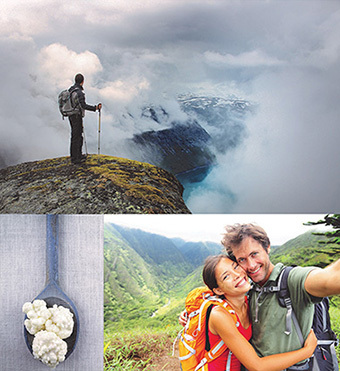 For centuries, kefir remained a secret of those hardy Caucasian mountain dwellers, who often lived to the age of 100 or more and regarded kefir as one of the sources of their remarkable vigor and longevity. Only occasionally did a passing explorer, like Marco Polo, have an opportunity to taste this legendary drink. Today, Kefir is rapidly growing in popularity among health-conscious consumers in the U.S as it is known for its probiotic value and remarkable health benefits. Kefir may well be the world’s oldest probiotic with people reporting that Kefir promotes healthy intestinal flora – a host of good bacteria for your intestinal tract. Kefir has tremendous health benefits for you, but it also does come with a few problematic qualities. Kefir has a tart flavor, unusual texture and calorie content are a turn-off for some, and its dairy base and animal source are problematic for others. Considering the reported complaints with the traditional kefir, there must be an easier way to enjoy the many health benefits. 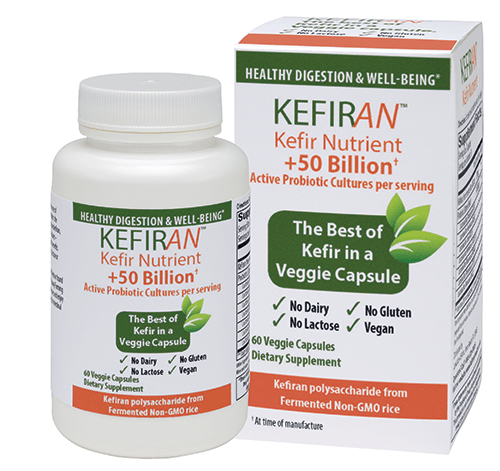 KEFIRAN is the best of traditional kefir drink in a veggie capsule. KEFIRAN contains NO dairy, lactose or gluten. KEFIRAN is vegan and low calorie. So you get all the positives from kefir without the negatives.